LOS ANGELES, CA (January 26, 2006) — FotoKem used its Imagica “Bigfoot” scanner to digitally recapture the faded glory of “South Pacific,” the 1958 65mm Todd AO classic. 20th Century Fox tapped FotoKem’s Large Format Group for the photochemical preservation and video mastering on the project, taking advantage of the facility’s 65mm scanner and its high speed 4K transfer capabilities. 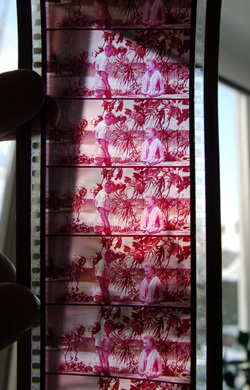 A sample of a Danish 70mm print of "South Pacific" dating back to 1958. Note how red it is. Speaking of original, 20th Century Fox discovered a print dating back to 1958 in a film archive in England that was the original “roadshow” version of the film distributed to theaters. This original version has 14 minutes of additional footage, containing about 60 subtle differences, that was later edited for aesthetic or political reasons. Working from the near 50-year-old print, FotoKem used a technique called “pre-flashing” to reduce the contrast in the replacement negative they produced from the print, before scanning this new negative at 4K on the Imagica scanner. FotoKem assembled the 227,000 files in a color correction suite where colorist Tom Sartori completed the final color pass on a da Vinci. The restored “South Pacific” will screen at The Entertainment Technology Center at USC’s Digital Cinema Laboratory on Monday, January 30, 2006 at 7:00 PM at the Lab’s historic Pacific Theater location – 6433 Hollywood Blvd. The screening will be followed by a Q&A with a panel including Schawn Belston, VP, Film Preservation and Asset Management, 20th Century Fox; and from FotoKem, Paul Chapman, VP of Technology; and Andrew Oran, VP of Sales & Operations, Large Format. 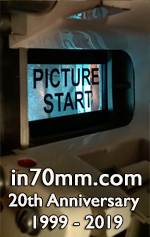 FotoKem is a premier independently owned film & video postproduction facility based in Burbank, CA. Established in 1963, FotoKem is a unique full service facility that embraces the entire sequence of motion picture and television postproduction by combining full-scale laboratory services with advanced digital finishing. See www.fotokem.com for additional information.